The Entry Point of Contact will receive an invoice after your entries are completed. More Traffic to your communities and potential buyers through your front door. $80,000+ Value (and increasing everyday) of digital advertising for your home(s) through the new and improved Parade Marketing Program. 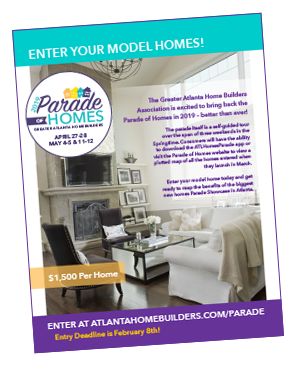 2019 “Parade in a Box”- an expertly packaged, ready-to-launch set of promotion vehicles for builders to implement your own promotion focusing on your specific homes. The package includes promotional flyers, supporting art files, recommended social media post schedules and wording and much more!